Just about to make your favorite curry and find that you are all out of cardamom? don't worry there are a few items that can work as a cardamom substitute. Of course, you could run out and buy more cardamom. If that isn’t an option or if you simply don’t want to have to leave the house, you could find a good cardamom substitute that will work nicely. For those who don’t know, cardamom is a bit spicy while having some herbal and citrus hints in its flavor. It is one of the base spices that is used in garam masla. It’s a unique spice, which makes it a bit of a puzzler at first when thinking of what could be used as a substitute. There are some good options there but it takes a little thinking outside of the box. It’s important to note that the substitute tips given here won’t completely replicate the flavor of cardamom. They will be able to do a good job of replacing it in your dish but there will be some slight differences. If you want the dish to be as it was originally intended, you should use the proper ingredients but substitutes will work in a pinch. Nutmeg does a pretty good job of providing the same type of flavor as cardamom for a dish. The good thing about using nutmeg as a substitute is that you’re very likely to have some sitting around in your cupboards. As such a common ingredient, it is not something that is hard to come by at all. You should use a little less of the nutmeg than you would cardamom, just to make sure that you don’t make your dish become overpowering. Add a bit more as needed. Spicing to taste is a good skill to have as a cook and it will come in handy in this situation. Cinnamon is another good option for you to consider. Much the same as nutmeg, it is very common and will probably be sitting in your kitchen somewhere. It should provide the right amount of spice that you want and will taste great in the dish. If you’re choosing between nutmeg and cinnamon, cinnamon seems to be the more popular option. Interestingly, a lot of people have had good results by mixing both cinnamon and nutmeg together. 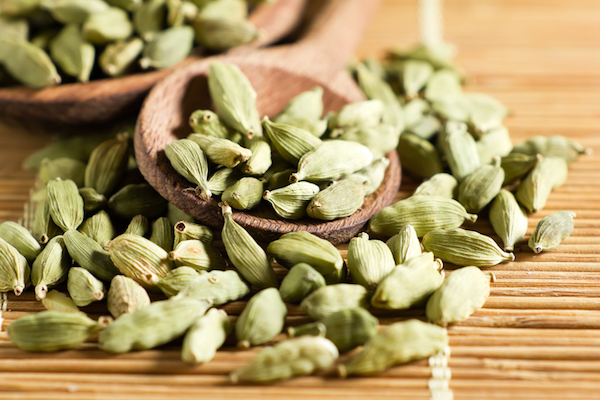 The complex taste of the two together more accurately resembles what you would experience with cardamom. If you want to give this a try, just be sure to use half of whatever the recipe called for. The results should be very pleasing and you might find that you even like it better with this combination of spices. Another combination option is cloves and cinnamon. You might be a bit less likely to have cloves sitting around but if you have some, this may be the most accurate substitute you can find. It comes pretty close to replicating the flavor of cardamom. If you’re making something with fish or another type of meat, this spicing option is absolutely delicious. Whatever you decide to try, it’s good to know that there are cardamon replacement options out there. You can experiment with the different options and see which of them works best for your needs. It can be a matter of taste when it comes to which is the best spicing option, of course. Your dish should turn out well no matter what, though. Keeping many different spices in your kitchen is essential if you’re a person who cooks regularly. You want to be able to have options for spicing things up differently and altering the flavor of dishes. Even when you do your best to stay stocked up on all of the essentials, it’s still possible you can run out of certain things.